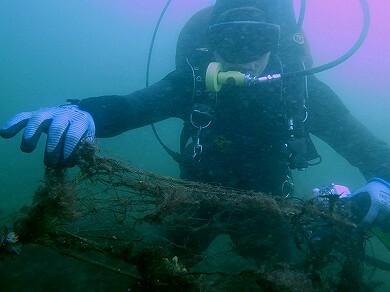 Lost fishing nets and fishing equipment, floating through the oceans are called “ghost nets”. These nets still can endanger fish, birds, sea mammals and other animals. They might have been cut loose during rough seas or storm, snatched on wrecks and other submarine obstacles or simply got disposed of as garbage. Numerous nets drift, supported by floats through the oceans and keep on fishing. They are also posing a threat for ships. 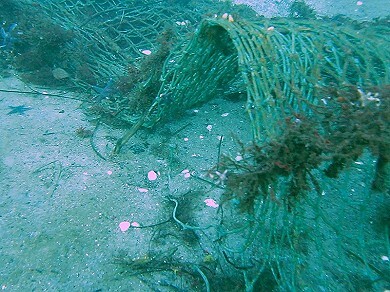 However, others sink to the bottom of the sea and get caught in wrecks where they can damage archaeological finds. Modern plastic nets can last for centuries and can emit toxic substances and microparticles.